Glamour freebies – a mini giveaway. So everyone and their mother probably already knows that this months Glamour magazine is giving away Benefit make-up. Many of you will have already picked up one or more of the bits on offer already – but I know that a lot of people had missed out as Glamour stocks sold out super-fast. So when I spotted some new stock in my local W.H.Smiths I decided to pick up another set of three (I already picked up a set of three for myself) to give-away. All three, brand new in boxes. Nope, this isn’t a huge give-away and it is essentially just a few freebies from a magazine (but I did of course buy the magazines to get the freebies!) but still – it’s a chance to get three bits of Benefit for even cheaper than the cost of three magazines. Plus it also means that any international people can get involved in the fun. So, the rules of the give-away…. There are no rules about having to be a follower – of course it would be lovely if you are a regular reader/follower, but it isn’t an essential. But you do have to leave a way to contact you (email is ideal). You can be from anywhere in the world, this is open internationally. To enter, you need to comment below (or drop me an email at beautyjunkielondon@gmail.com if easier – please put ‘Benefit Giveaway’ in the subject) and tell me what your favorite sort of post to read on blogs is: this can be any sort of post from any sort of blog (face of the day, nail of the day, reviews, random rambles, outfit of the day, recipes, interior-design posts….ANYTHING) I just want to know what you love about blogs. I’m afraid if you don’t do this then you won’t be included – anyone who just writes ‘enter me’ will have the comment removed, sorry! The give-away ends at 9pm GMT on 23rd June 2010. I will then use random.org to pick a winner. I think that’s about it. 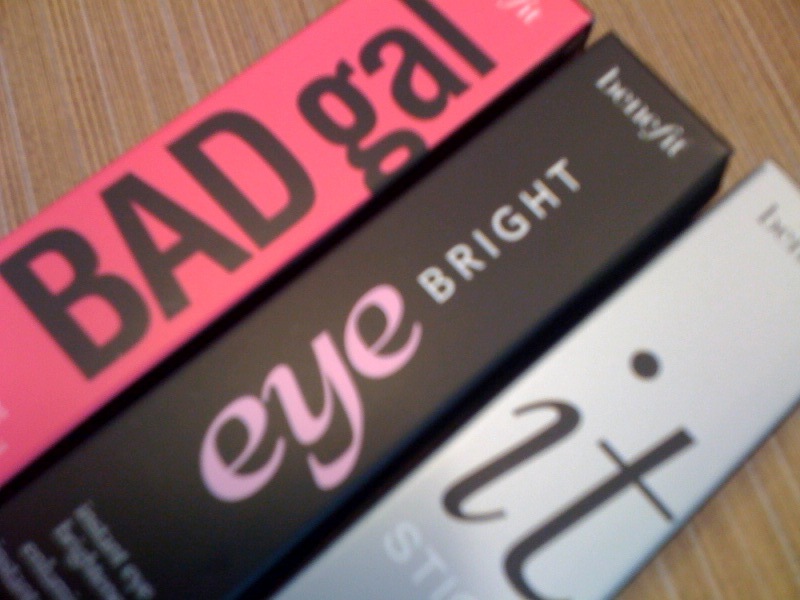 It’s not a huge pile of make-up from MAC or anything – but still – hopefully it will make whoever wins these bits happy! I love to read tutorials and DIY. I love to read reviews. I think it is a fun way to hear about products and interesting to learn some more about it. I like the short (the positive, negative and conclusion) and in-dept reviews as well. I’ve been reading your blog for about a month now, so glad I stumbled across it. Mostly, I come here for the reviews, I’m quite the make-up junkie so I really love all the make up reviews. Also, I really like the fact you review every day products like shampoos and things. I mostly buy high street brands and I like having reviews as a guideline. I love face of the day posts. I really like to read reviews on blogs because they’re usually more thorough than ones on Sephora or other websites. I love NOTD and hauls, they always give me idea’s and inspiration =). :O I totally want this ! i love to read about nail of the day posts, so inspiring! i also like to read posts that are a bit more personal.. maybe a blogger’s weekend, vacation, etc. i personally think they add a nice personal touch to a blog. I found out about the Benefit freebies from Lollipop26 and was so jealous that we never get these perks here in the US. So thank you so much for holding this giveaway! I think the best things I like to read about are product reviews, I know watching adverts for all these new items I think “do they actually work” and then reviews help you to form that decision. I also like it when you post up any bargain offers that you have seen on the high street. I love to read about reviews, FOTD and sometimes hauls. My favorite things to read on blogs is interior design, I love getting inspiration and seeing so many styles! I also lovvvee outfit of the day blogs! Definitely a favorite of mine! I love reading hauls from blogs from beauty junkies overseas, to see what the hot products they like is. I have some family in Europe and they send me care packages so these blogs add to my wishlists! I love haul posts, reviews and nail of the day. I almost always take a look here when friends go to the UK and ask me if I want anything, they know I love makeup! I love spending time on cooking blog discovering the incredible cakes people can bake (like macarons for example). I really like make-up swatches and impartial reviews. I also like to see the way that girls dress, i’m not good in finding original ideas so it gives me ideas. I love face of the day and outfit ot the day.. Also like readind hauls and reviews and of course tutorials. Photography is interesting too.. The beauty junkie I am, I obviously look for reviews and information on products – at least that’s how I have found every beauty blog I read. So that would be crucial, I guess. But after I have technically found a blog, I only read back and stay a real follower, if I feel like I can form some connection with the blog owner. I really enjoy knowing little bits about the person behind the blog, may it be her makeup wishes, her recent trips, her love for animals, her aspirations, whatever (yes, mainly girls, but I wouldn’t discriminate :)). wauw! I really want to win! It shoot be the first time than I win something! and i’m from Belgium and I’m following you!